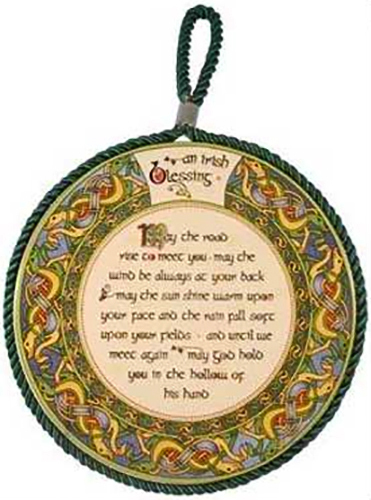 This Irish blessing plaque features Celtic knot-work and is ready to hang on your kitchen wall and it may also be placed on your table to use as a pot trivet. The Irish trivet is a rope lined and hand-painted ceramic plaque with a cork backing along with a Celtic knot motif. The colorful design measures 6 1/2" diameter and is ready to hang with the included green rope. 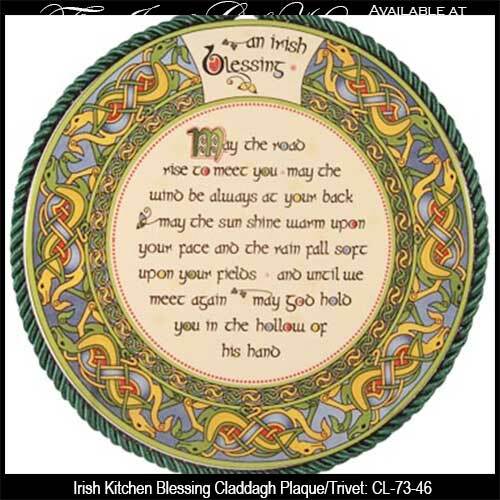 The Irish kitchen blessing is made in Ireland by Clara and is gift boxed with a brief Irish blessing explanation on the reverse side along with a Celtic knot history card that is complements of The Irish Gift House.